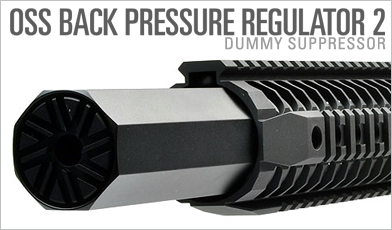 The toy silencer can be applied to most of NATO rifles, machine guns and rifles with M4 style flashhiders. We have two versions of the HALO silencer made by MadBull in Taiwan. Come with foam. Illegal in US. Available in Asia and Europe. 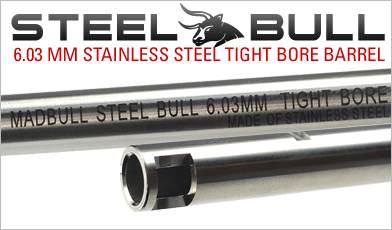 Solid Aluminum tube. Legal in the US. NOT a silencer. NOTE: Unregistered silencers is totally illegal in the US. Be careful. Please do not use any kind of silencer even if it is designed for toy. See ATF website here! See Question M30. NOTE: It is our honor to produce Airsoft products that are fully licensed by Gemtech. Beware of expensive imitations from other companies. Only MadBull is licensed to produce accurate copies of the real Gemtechs. 100% in all details including authentic laser engraving of the full Gemtech license. 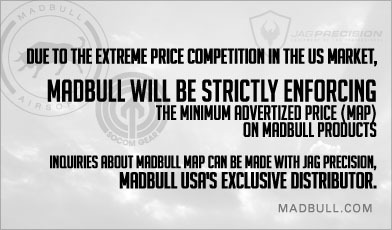 If it's not Madbull, it's a copy!